Why not a picture of the Bremerton Marina and a couple of dollar signs imposed over it. That would be more fitting. From someone who is involved in marketing and graphic art conception and product packaging at my company in the private sector, I will give you my professional opinion. 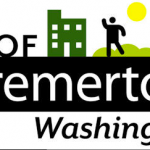 #1 The new logo is a hodge podge of colors and images that do not work well together and could be associated with any community that has a Port. Too many images clumped together have it visually assaulting the viewer with random colors and images all at one time. Yikes this is awful. #2 Going from a 2 color logo to a 4 color logo is going to be much more expensive no matter what snails pace rate the individual switchover of items that need replacement occur. #3 A new logo means vendors will most likely be charging new set up fees for nearly everything it is used on or for. 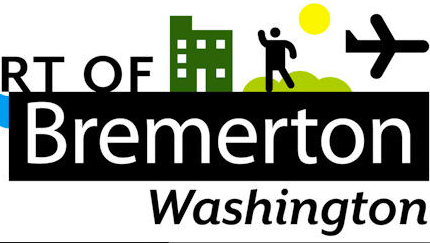 #4 A new logo implemented slowly over time means Port of Bremerton materials will be a mis-matched combination of both logos for who knows how long. Tacky. Even worse, I just realized it is a (5) color logo instead of (2). For cost and clarity of the logo whether or not it is produced in black and white, 2 maybe 3 colors are best. More than that for a logo is just plain wasteful, expensive and gaudy. Ah, It appears logic has returned to the Port of Bremerton. With 95% of the staff, the present commissioners, and the new CEO opting for the old logo; one has to wonder about the previous idiots who railroaded the new log through. As normal, they obviously didn’t consider cost. How long will it take us to recover from the days of Mahan, Huntington, and cohort Botkin? Now if the new powers ever do anything (Seabeck, Marina?) for the tax payers disproportionately milked in the far reaches of the crazy Port boundaries; maybe the word Sane will replace Insane. The old logo is fine and says all it needs to: propeller for the airport and water for ferries and boats, and only one color — blue. Everybody likes blue. That new logo doesn’t say what the port is about—what is that building for and the sun and the man and the hills behind him and that huge white on black lettering—way too busy and garish. A logo is the least of what they should be working on—just a waste of time and money.